The morning after the stitches accident, we thought it would be great to learn about the Vietnamese culture. 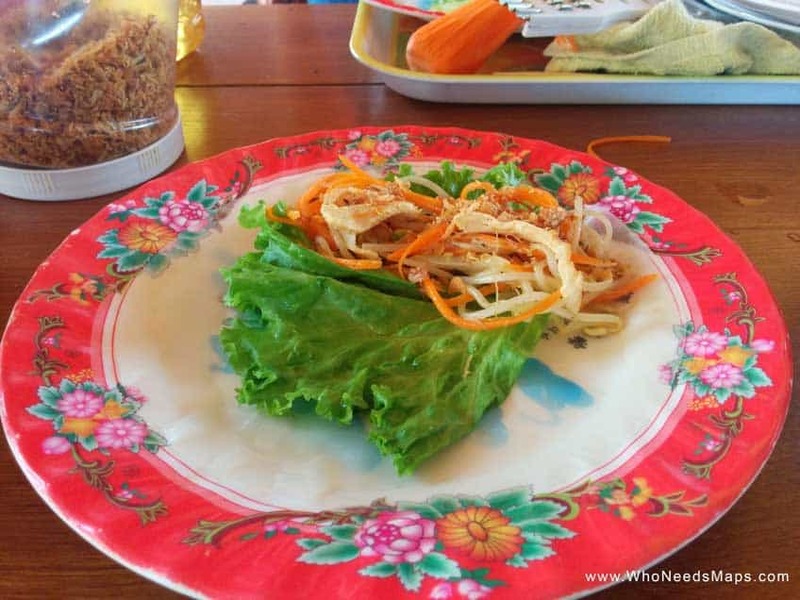 What better way to learn Vietnamese culture than through FOOD?! A nice, calm and relaxing day filled with food and not drinks sounded pretty good after the night we had. So the days agenda was set, Vietnamese cooking class it was! 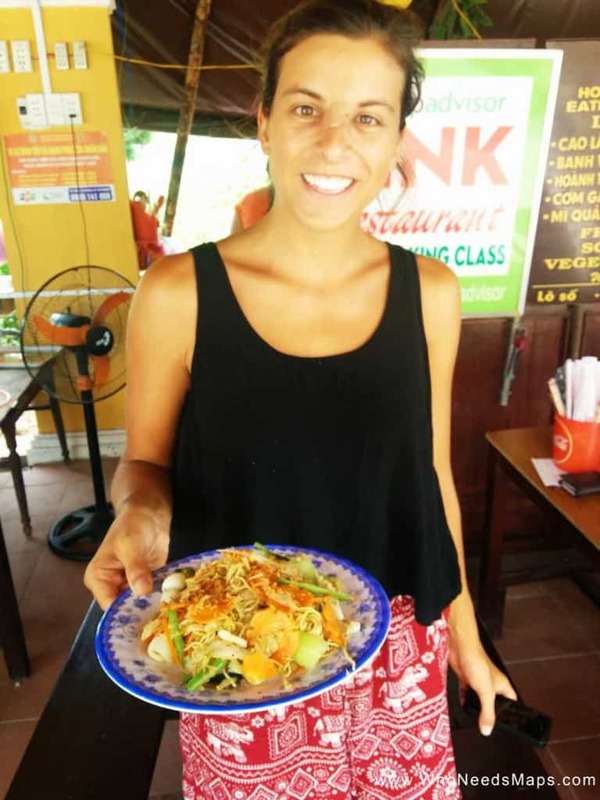 We walked around a few days before looking for a class, searching on trip advisor and we finally found one in a small little nook on the side on the other side of the Hoi An River. It was just an empty restaurant that had a big sign that said, “ COOKING CLASS. Morning glory” along the waterfront. Hmm, morning glory… sounds good to us! We decided to cook at Pinks cooking class. 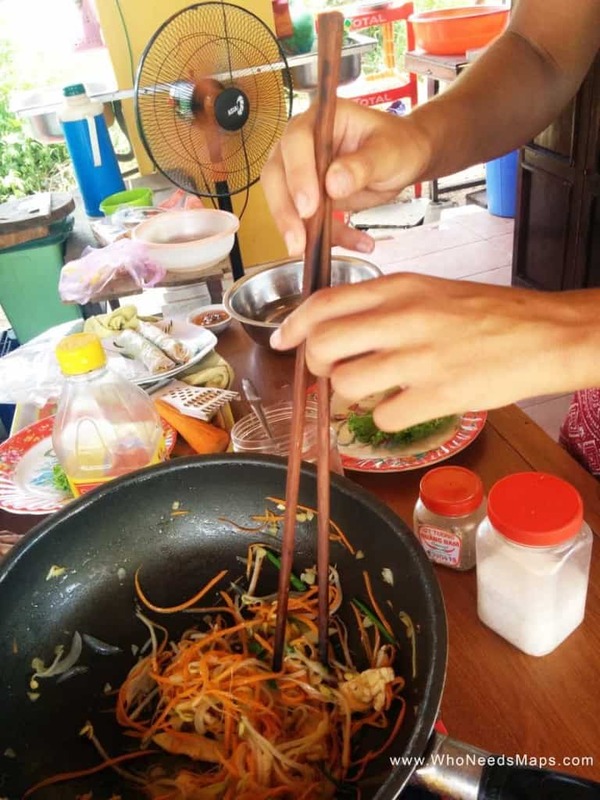 For $15 each, we got bikes with baskets to take on a market tour, some weird fruit shakes, all the veggies and meats for our meals, a little booklet to write down the recipes and the chance to learn how to make 4 Vietnamese dishes of our choice! We had SO MUCH FUN! It was so great to chat to Vietnamese locals, learn about their favorite things to do, and how to cook like a true Vietnamese! We started our day with riding our bikes to the local morning Vietnam markets. We picked out fresh fruits, veg, and the meat for our meals. Can you tell who is the local? I bet you can’t! 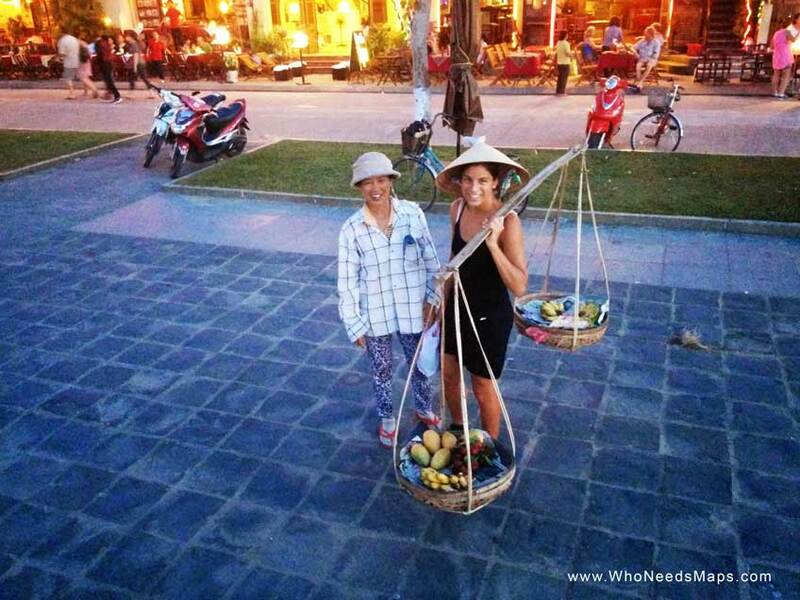 We experienced the Vietnam Markets along the river in Hoi An, which was a really great cultural experience. Cheap food, fresh produce, and great kitchen gadgets were all to be found here. Our tour guide was sweet enough to take us to a shake stall, where they make fresh shakes, but this was easily one of the weirdest things we have EVER tried. 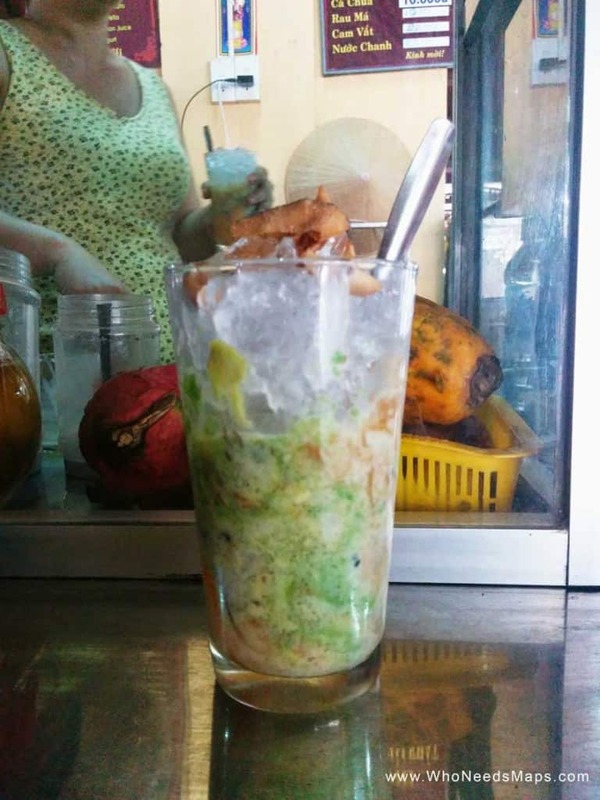 It was avocado, papaya, banana, melon, and other fruit, MUSHED not blended, with a cup of ice, some milk poured in it, and topped with some toasted coconut. It tasted almost as good as it looked :/ Points for cultural effort though, right? We got to pick 4 meals to cook from the menu: chicken Vietnamese spring rolls, squid stir fry noodles, chicken pho, and spicy beef. And honestly, it was so easy, I am shocked they get so much flavor in so little time and such simple ingredients! 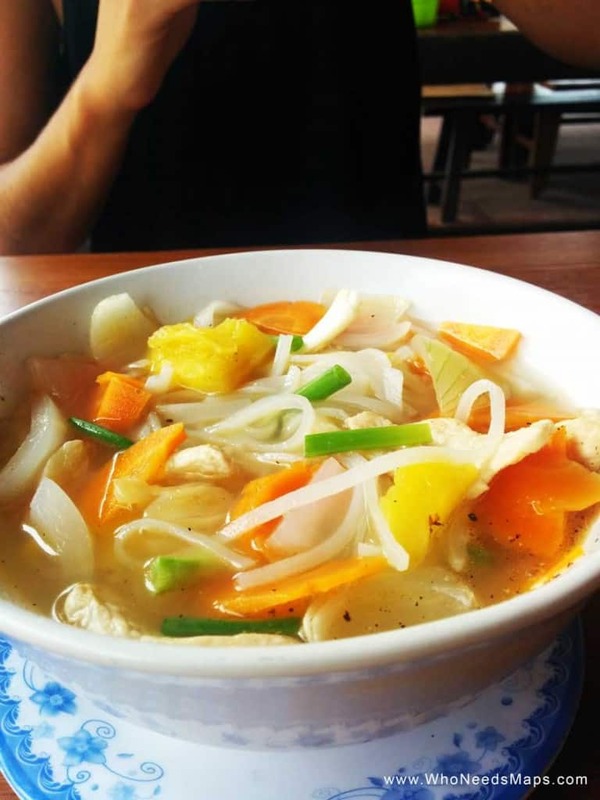 We started with the Chicken Pho, a local soup dish with noodles. 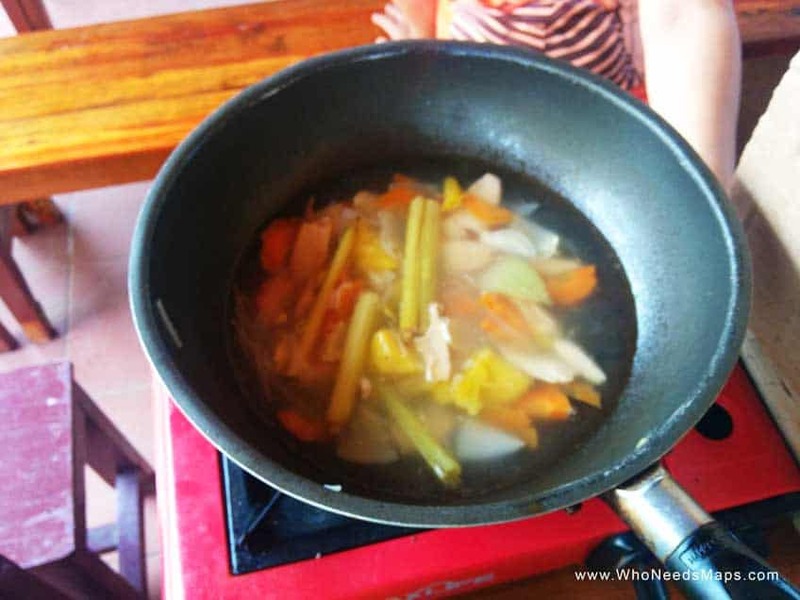 You start off by cooking the shredded chicken with carrots, celery, onions, and some cracked lemon grass and then you add your water (as the broth) along with the vermicelli noodles. TADA, pho ga (chicken pho)!!! It’s THAT simple! Next up was the spicy beef! Mmm, spicy beef was so good! It was quite simple and we got to use a motar, aka THE MUSHER! Chop some lemon grass, garlic, salt, pepper, and soy sauce and mush away! This is the “spicy sauce” to the spicy beef. Slice some beef, some onions, and green peppers, throw it in a pan with a touch of oil, and voi la!! You have a Vietnamese spicy beef dish! We would have a picture of the final product, but we got too hungry and ate it all…. For course number 3, we made a squid stir fry. All you need is some sliced carrot, bok choy, snap peas, onion, garlic, ramen noodles and the cut squid seasoned with salt and pepper. Chuck it into a pan with some oil and start cooking the squid, onion, and garlic first then put all the rest in. Top it off with some delicious fried shallot, you have a fantastic squid stir fry. 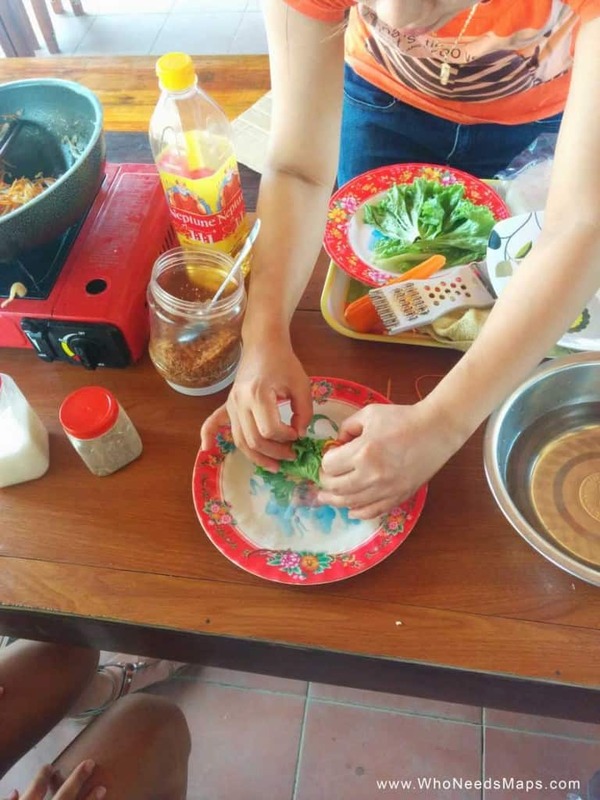 Last but not least, we made fresh Vietnamese spring rolls, our favorite part of our Vietnamese cooking class. These were the tastiest and so unbelievably simple to make. We start off by cooking the chicken (sliced into small pieces) with pepper, salt, and crushed garlic. 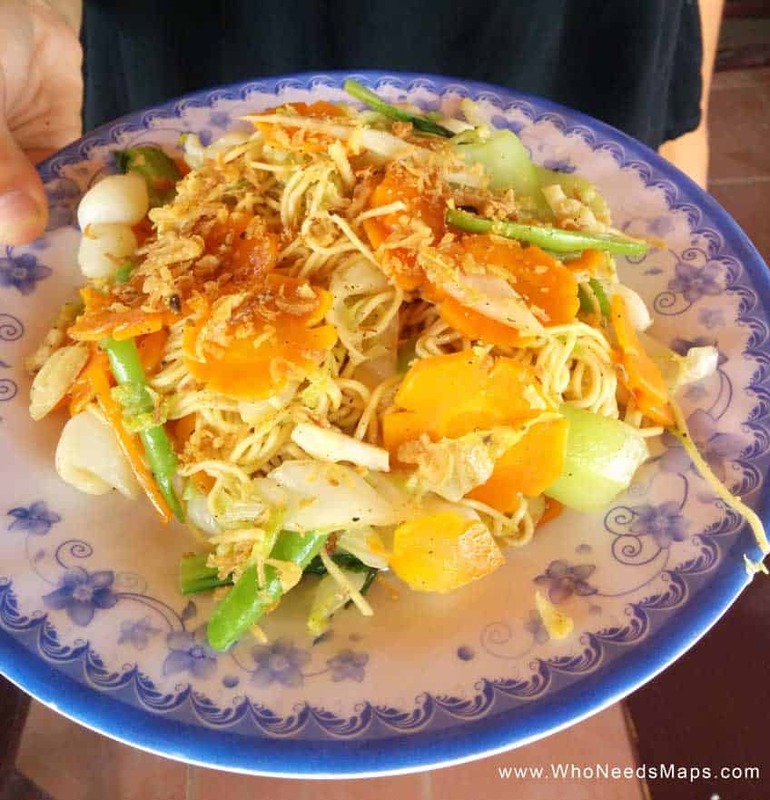 Once cooked, add shredded carrots, green onions, bean sprouts, and onions with salt, pepper, crushed garlic, quinoa, and soy sauce until it is all cooked down. This is the mixture for the inside of your delicious spring rolls! Next step is to get some rice paper and lettuce. 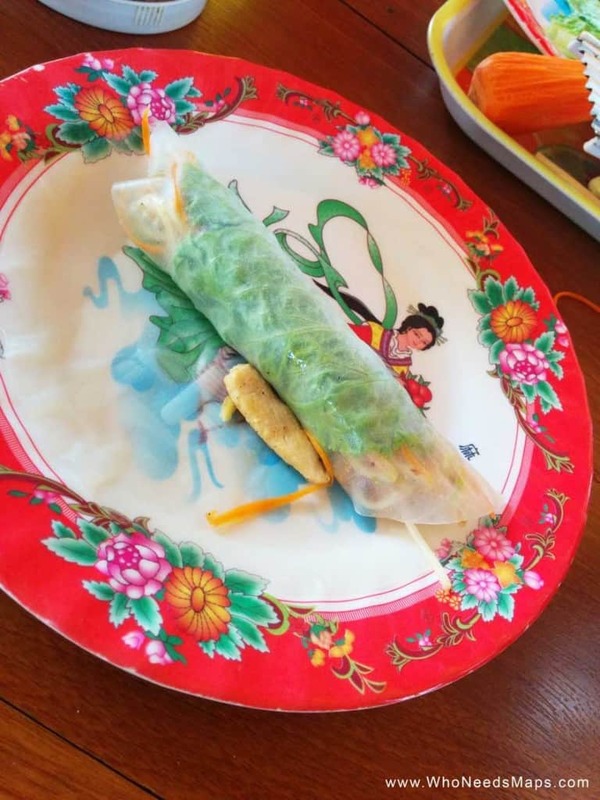 Dip the rice paper in water to moisten the wrap. Lay it down and line it with some lettuce in the middle. Put the chicken mixture in the one side of the wrap and start rolling while tucking in the outer part of the wrap. Top the filling with some fried shallots (the best part) and there you go! Fresh Vietnamese spring rolls! We highly recommend taking a Vietnamese cooking class. It was fun, delicious, educational, and a great way to tap into Vietnamese culture. If you have the chance to take one, DO IT! You may now call us Master Chef Jenn and Sous Chef Jack. Travel gear used during our trip! Have you ever done a cooking class? Tell us all about it! 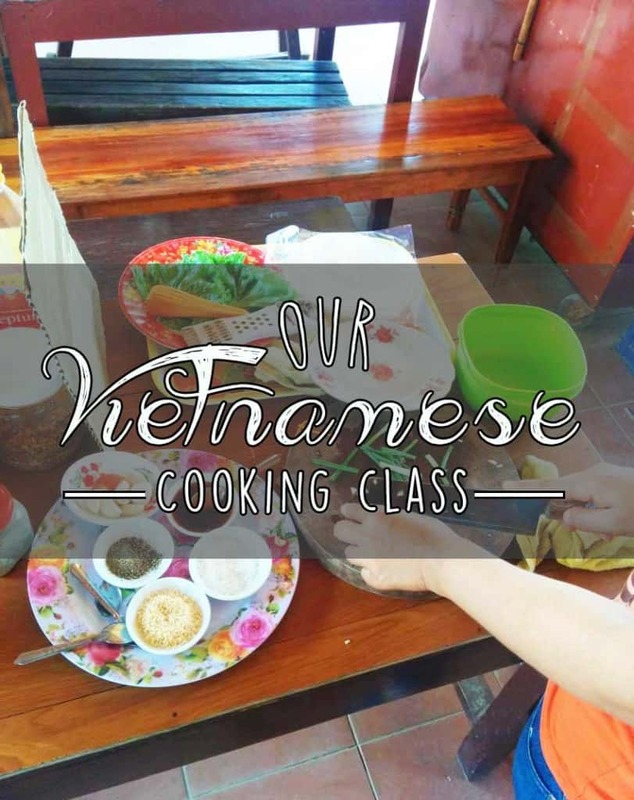 Please share this with your friends if you are ever planning on going to Vietnam or to do a cooking class :) Happy travels! Looks awesome! 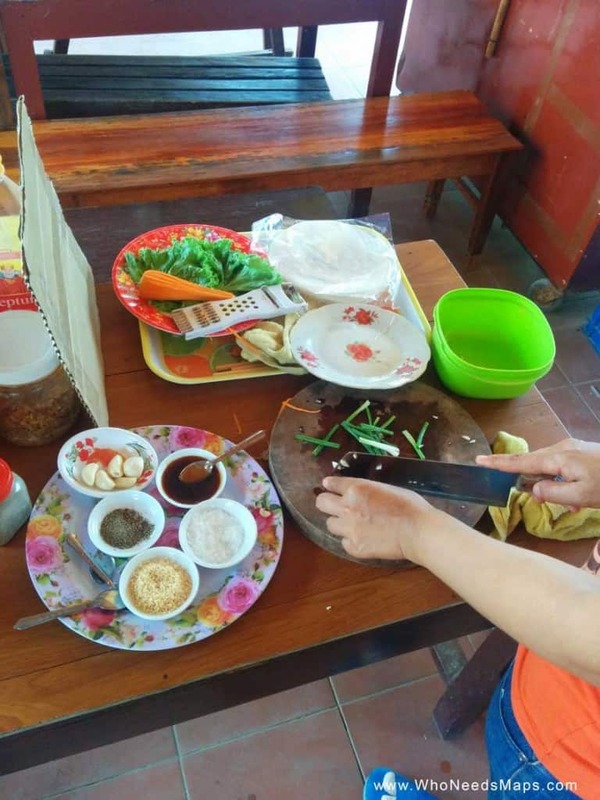 I did a cooking class at a vegan restaurant in Hoi An, it was also great. That drink though. Haha! Everything you made looks really good. 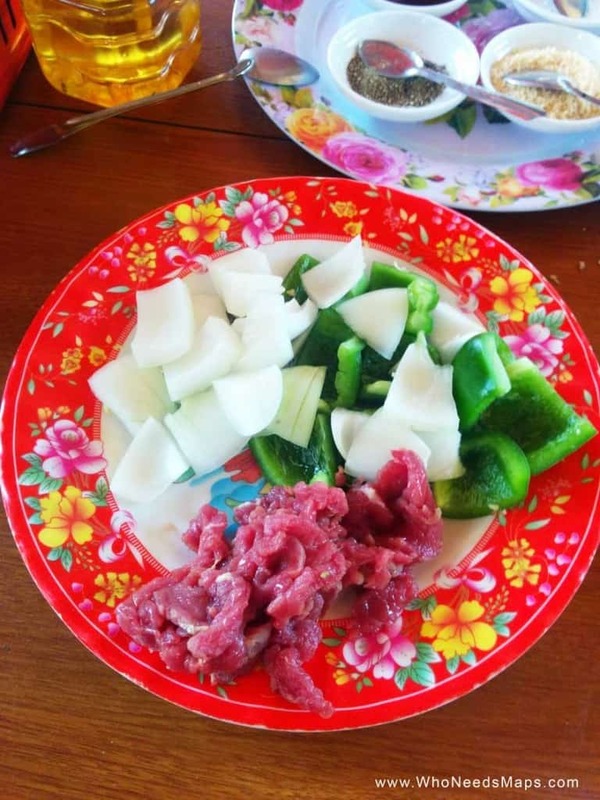 We took a cooking class in Thailand and loved it. I’m sure this would be a good one to do too. I do really like Vietnamese food. We wanted to do a Thai Cooking class so badly but time just didn’t allow for it. I think its a great way to learn about the culture. 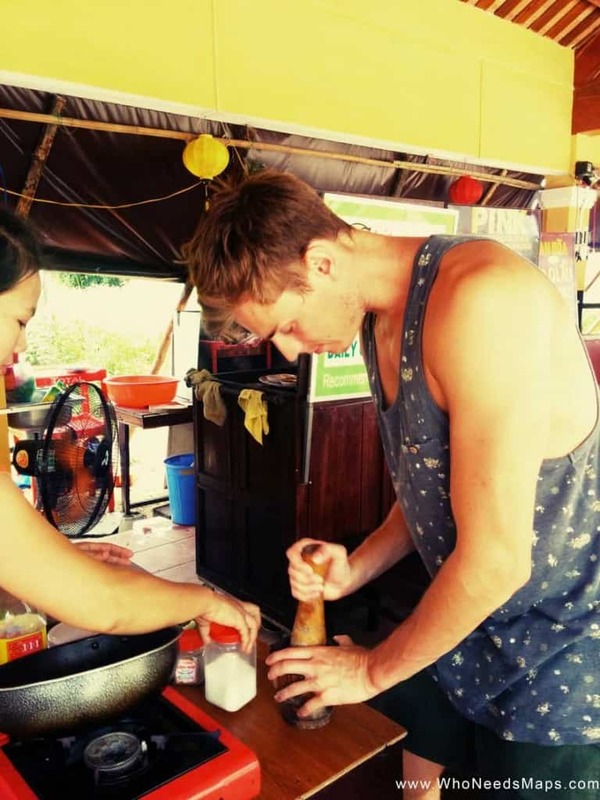 If you have a chance, you should definitely check out a cooking class in Vietnam! Thank you! You should take a cooking class anywhere you travel to, its such a treat! 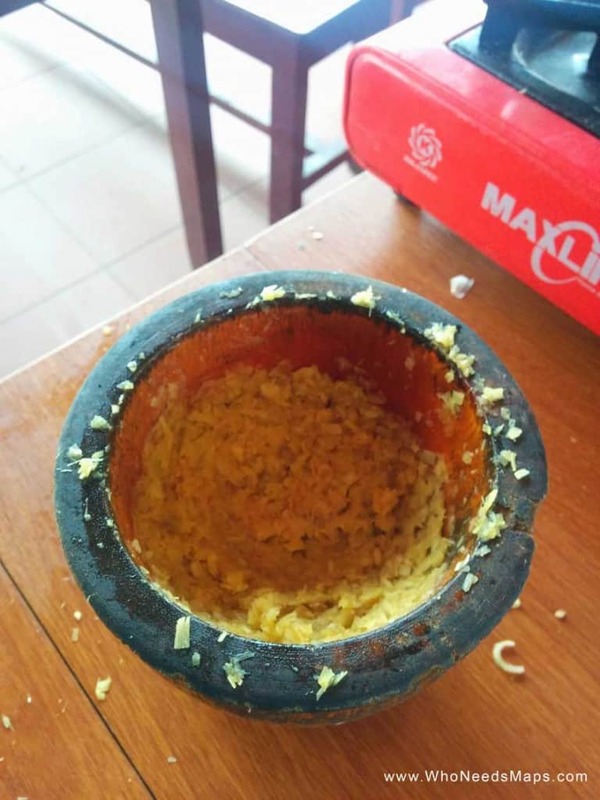 Make sure it is a local cooking class and not a touristy westernized version of a class! The recipe looks great! I love going out for Vietnamese food, but sometime I try making it at home. Thank you for sharing such great foods! Get our free Travel Checklist and awesome updates!